This article is about snow footwear. For the resort, see Snowshoe Mountain. For the hare, see Snowshoe hare. For other uses, see Snowshoe (disambiguation). A snowshoe is footwear for walking over snow. Snowshoes work by distributing the weight of the person over a larger area so that the person's foot does not sink completely into the snow, a quality called "flotation". Snowshoeing is a form of hiking. In the past, snowshoes were essential tools for fur traders, trappers and anyone whose life or living depended on the ability to get around in areas of deep and frequent snowfall, and they remain necessary equipment for forest rangers and others who must be able to get around areas inaccessible to motorized vehicles when the snow is deep. However, snowshoes are mainly used today for recreation, primarily by hikers and runners who like to continue their hobby in wintertime. Snowshoeing is easy to learn and in appropriate conditions is a relatively safe and inexpensive recreational activity. However, snowshoeing in icy, steep terrain can be more dangerous. Before people built snowshoes, nature provided examples. Several animals, most notably the snowshoe hare, had evolved over the years with oversized feet enabling them to move more quickly through deep snow. The origin and age of snowshoes are not precisely known, although historians believe they were invented from 4,000 to 6,000 years ago, probably starting in Central Asia. British archaeologist Jacqui Wood hypothesized that the equipment interpreted to be the frame of a backpack of the Chalcolithic mummy Ötzi was actually part of a snowshoe. Strabo wrote that the inhabitants of the Caucasus used to attach flat surfaces of leather under their feet and that its inhabitants used round wooden surfaces, something akin to blocks, instead. 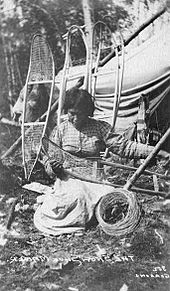 However, the "traditional" webbed snowshoe as we know it today had direct origins to North American indigenous people, e.g., the Huron, Cree, and so forth. Samuel de Champlain wrote, referencing the Huron and Algonquin First Nations, in his travel memoirs (V.III, pg. 164), "Winter, when there is much snow, they (the Indians) make a kind of snowshoe that are two to three times larger than those in France, that they tie to their feet, and thus go on the snow, without sinking into it, otherwise they would not be able to hunt or go from one location to the other". In 2016, Italian scientists reported "the oldest snowshoe in the world" discovered in the Dolomites and dated to between 3800 and 3700 B.C. The indigenous people of North America developed the most advanced and diverse snowshoes prior to the 20th century. Nearly every Indigenous peoples of the Americas culture developed its own particular shape of shoe, the simplest and most primitive being those of the far north. The Inuit have two styles, one being triangular in shape and about 18 inches (46 cm) in length, and the other almost circular, both reflecting the need for high flotation in deep, loose and powdery snow. However, contrary to popular perception, the Inuit did not use their snowshoes much since they did most of their foot travel in winter over sea ice or on the tundra, where snow does not pile up deeply. Southward the shoe becomes gradually narrower and longer, the largest being the hunting snow-shoe of the Cree, which is nearly 6 ft (1.8 m) long and turned up at the toe. Even smaller models, developed most notably by the Iroquois, are narrower and shorter, reflecting the need for maneuverability in forested areas. The Plains Indians wore snowshoes on their winter season bison hunts before horses were introduced. Despite their great diversity in form, snowshoes were, in fact, one of the few cultural elements common to all tribes that lived where the winters were snowy, in particular, the Northern regions. Snowshoes were slowly adopted by Europeans during early colonialism in what later became Canada and the United States. The French voyageurs and coureurs des bois began to travel throughout the land of the Cree, Heuron, and Algonquin groups of indigenous North Americans in the late 17th century to trap animals and trade goods. In order to travel effectively in the terrain and climate, they utilized the tools of the native populations, such as snowshoes and canoes. Snowshoes became popular during the French and Indian Wars, during conflicts such as The Battle on Snowshoes, when both the French/Indian and British factions both wore snowshoes to battle above a reported four feet of snow. The Oxford English Dictionary reports the term being used by the English as early as 1674. In 1690, after a French-Indian raiding party attacked a British settlement near what is today Schenectady, New York, the British took to snowshoes and pursued the attackers for almost 50 miles (80 km), ultimately recovering both people and goods taken by their attackers. The "teardrop" snowshoes worn by lumberjacks are about 40 inches (1.0 m) long and broad in proportion, while the tracker's shoe is over 5 feet (1.5 m) long and very narrow. This form, the stereotypical snowshoe, resembles a tennis racquet, and indeed the French term is raquette à neige. This form was copied by the Canadian snowshoe clubs of the late 18th century. Founded for military training purposes, they became the earliest recreational users of snowshoes. The snowshoe clubs such as the Montreal Snow Shoe Club (1840) shortened the teardrop to about 40 inches (100 cm) long and 15 to 18 inches (380 to 460 mm) broad, slightly turned up at the toe and terminating in a kind of tail behind. This is made very light for racing purposes, but much stouter for touring or hunting. The tail keeps the shoe straight while walking. Another variant, the "bearpaw", ends in a curved heel instead of a tail. While many early enthusiasts found this more difficult to learn on, as they were thicker in the middle and rather cumbersome, they did have the advantage of being easier to pack and nimbler in tight spaces. Two forms of traditional bearpaw snowshoes developed: an eastern version used by "spruce gummers" consisting of an oval frame with wooden cross braces, and a western version with a rounded triangular frame and no wooden bracing. Traditional snowshoes are made of a single strip of some tough wood, usually white ash, curved round and fastened together at the ends and supported in the middle by a light cross-bar. The space within the frame is filled with a close webbing of dressed caribou or neat's-hide strips, leaving a small opening just behind the cross-bar for the toe of the moccasined foot. They are fastened to the moccasin by leather thongs, sometimes by buckles. Such shoes are still made and sold by native peoples. Outside of indigenous populations and some competitions such as Arctic Winter Games, very few of the old-fashioned snowshoes are actually used by enthusiasts anymore, although some value them for the artisanship involved in their construction. They are sometimes seen as decorations, mounted on walls or on mantels in ski lodges. Even though many enthusiasts prefer aluminum snowshoes, there is still a large group of snowshoe enthusiasts who prefer wooden snowshoes. Wooden frames do not freeze as readily. Many enthusiasts also prefer wood snowshoes because they are very quiet. 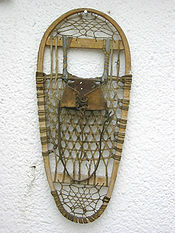 While recreational use of snowshoes began with snowshoe clubs in Quebec, Canada (who held events where races and hikes were combined with fine food and drink), the manufacture of snowshoes for recreational purposes really began in the late 19th century, when serious recreational use became more widespread. In the late 20th century the snowshoe underwent a radical redesign. It started in the 1950s when the Vermont-based Tubbs company created the Green Mountain Bearpaw, which combined the shortness of that style with an even narrower width than had previously been used (Pospisil 1979). This rapidly became one of the most popular snowshoes of its day. In 1972, experimenting with new designs in Washington's Cascade Mountains, Gene and Bill Prater created the snowshoe known today. They began using aluminum tubing and replaced the lace with neoprene and nylon decking. To make them easier to use in mountaineering, the Praters developed a hinged binding and added cleats to the bottom of the shoe. The Sherpa Snowshoe company started manufacturing these "Western" shoes and they proved very popular. Eastern snowshoers were a bit more skeptical at first, believing that the style was unnecessary in the east, until the Praters demonstrated their improved effectiveness on New Hampshire's Mount Washington. These use an aluminum or stainless steel frame and take advantage of technical advances in plastics and injection molding to make a lighter and more durable shoe. They require little maintenance, and usually incorporate aggressive crampons. Some, such as the "Denali" model made by Mountain Safety Research, use no metal frame and can be fitted with optional detachable tail extenders. Newer models have heel-lifters, called "ascenders", that flip up to facilitate hill climbing. The use of solid decking in place of the standard latticework of lacing came as a surprise to many enthusiasts, since it challenged a long-held belief that the lattice was necessary to prevent snow from accumulating on the shoe. In practice, however, it seems that very little snow comes through the openings in either type of shoe. Neoprene/nylon decks also displayed superior water resistance, neither stretching as rawhide will when wet nor requiring annual treatment with spar varnish, features that were immediately appreciated. Eventually they were replaced with even lighter materials such as polypropylene. This tendency also gave way to the creation of inflatable snowshoes made of different fabrics such as cordura and thermoplastic polyurethane (TPU). These more athletic designs have helped the sport enjoy a renaissance after a period of eclipse when winter recreationists showed more interest in skiing. In the U.S., the number of snowshoers tripled during the 1990s. In fact, ski resorts with available land are beginning to offer snowshoe trails to visitors, and some popular hiking areas are almost as busy in the colder months as they are on warm summer weekends. Properly adjusted bindings on two snowshoes of different size. Note use of gaiters. As many winter recreationists rediscover snowshoeing, many more new models of snowshoe are becoming available. Ski areas and outdoor equipment stores are offering snowshoes for rent. mountaineering (the largest, meant for serious hill-climbing, long-distance trips and off-trail use). Sizes are often given in inches, even though snowshoes are nowhere near perfectly rectangular. Mountaineering shoes can be at least 30 inches (76 cm) long by 10 inches (25 cm) wide; a lighter pair of racing shoes can be slightly narrower and 25 inches (64 cm) or shorter. Regardless of configuration, all wooden shoes are referred to as "traditional" and all shoes made of other materials are called "modern." Notwithstanding these variations in planned use, larger users should plan on buying larger snowshoes. A common formula is that for every pound of body weight, there should be one square inch of snowshoe surface (14.5 cm²/kg) per snowshoe to adequately support the wearer. Users should also consider the weight of any gear they will be packing, especially if they expect to break trail. Those planning to travel into deep powder look for even larger shoes. Many manufacturers now include weight-based flotation ratings for their shoes, although there is no standard for setting this yet. As is often the case with downhill skis, wood-frame snowshoes and suitable bindings are typically marketed and purchased separately rather than as a single piece. One common style is termed the "H" binding, as it consists of a strap around the heel crossing a strap around the toe and one at the instep, forming a rough version of the eponymous letter. On modern shoes, there are two styles of binding: fixed-rotation (also known as "limited-rotation") bindings, and full-rotation (also known as "pivot") bindings. With either binding system, the heel is left free, and the difference is in how the ball of the foot is attached to the snowshoe. In fixed-rotation bindings, the binding is attached to the snowshoe with an elastic strap that brings the tail of the snowshoe up with each step. The snowshoe therefore moves with the foot and the tail does not drag. Fixed-rotation bindings are preferred for racing. Full-rotation bindings allow the user's toes to pivot below the deck of the snowshoe. They allow the crampon cleats that are under the foot to be kicked into a slope for grip in climbing, but are relatively awkward for stepping sideways and backwards as the tail of the snowshoe can drag. Fixed-rotation bindings often cause snow to be kicked up the back of the wearer's legs; this does not tend to happen with full-rotation bindings. A series of straps, usually three, are used to fasten the foot to the snowshoe. Some styles of binding use a cup for the toe. It is important that a user be able to manipulate these straps easily, as removing or securing the foot often must be done outdoors in cold weather with bare hands, exposing him or her to the possibility of frostbite. When putting on snowshoes, left is distinguished from right by which way the loose ends of the binding straps point: always outward, to avoid stepping on them repeatedly. In 1994, Bill Torres and a younger associate developed the step-in binding, designed to make it easier for snowshoers wearing hard-shelled plastic boots (serious mountaineers) to change from snowshoes to crampons and back again as needed. Snowshoers often use trekking poles as an accessory to help them keep their balance on the snow. Some manufacturers have begun making special snowshoeing models of their poles, with larger baskets more like those found on ski poles (which can also be used). Other than that, no other special accessories are required. Most types of footwear can be worn with snowshoes, although hiking boots are the preferred choice among most recreational users (except racers, who prefer running shoes). Ski boots, however, will only work with certain snowshoes such as the MSR Denali, otherwise requiring backcountry skiers to carry other footwear for the snowshoe portion of their trip. If going into deep snow, snowshoers will often take along gaiters to keep snow from getting into their boots from above. 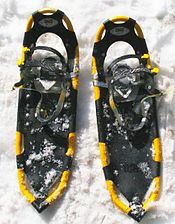 Some manufacturers make their snowshoes with boot or toe covers to provide the same protection. A carrier of some type is also advisable, particularly if the trip will not take place entirely on snowshoes. Some backpack manufacturers have designed special packs with "daisy chains," strips of looped nylon webbing on which the shoes can be secured. Snowshoe manufacturers, too, have begun including carriers and tote bags for their products, if for no other reason than to prevent the often-sharp cleats on the bottom from damaging surfaces they come in contact with. Since snowshoeing is commonly done in cold weather, users typically prepare for it by dressing in layers and carrying the appropriate equipment. Snowshoes function best when there is enough snow beneath them to pack a layer between them and the ground, usually at a depth of 8 inches (20 cm) or more. However, contrary to popular belief, snowshoes perform poorly on very icy and steep terrain. Compared to crampons, snowshoes give relatively little grip on ice. It is common for novice snowshoers to climb up a steep slope to a summit and then have difficulty climbing back down, which tends to be more difficult than ascending. In icy conditions, summer hiking routes may require mountaineering skills and equipment, not snowshoes. It is often said by snowshoers that if you can walk, you can snowshoe. This is true in optimal conditions, but snowshoeing properly requires some slight adjustments to walking. The method of walking is to lift the shoes slightly and slide the inner edges over each other, thus avoiding the unnatural and fatiguing "straddle-gait" that would otherwise be necessary. A snowshoer must be willing to roll his or her feet slightly as well. An exaggerated stride works best when starting out, particularly with larger or traditional shoes. Walking skills are easily transferable to straightforward snowshoe travel, but this is not always the case with turning around. While a snowshoer with space to do so can, and usually does, simply walk in a small semicircle, on a steep slope or in close quarters such as a boreal forest this may be impractical or impossible. It is thus necessary in such circumstances to execute a "kick turn" similar to the one employed on skis: lifting one foot high enough to keep the entire snowshoe in the air while keeping the other planted, putting the foot at a right angle to the other (or as close as possible for the situation and the snowshoer's physical comfort), then planting it on the snow and quickly repeating the action with the other foot. This is much easier to accomplish with poles. Some modern snowshoes have bars that can be flipped up for ascending steep slopes. The wearer's heel can rest on the bar. 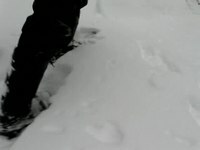 While the cleating and traction improvements to modern snowshoes have greatly enhanced snowshoers' climbing abilities, on very steep slopes it is still beneficial to make "kick steps," kicking the toes of the shoes into the snow to create a kind of snow stairs for the next traveler to use. Alternatively, snowshoers can use two techniques borrowed from skis: the herringbone (walking uphill with the shoes spread outward at an angle to increase their support) and the sidestep. For those snowshoers who use poles, it can be easier to rely on the poles to 'pull' oneself with regular stride, up the slope. Once a trail has been broken up a mountain or hill, snowshoers often find a way to speed up the return trip that manages to also be fun and rests the leg muscles: glissading the trail, or sliding down on their buttocks. This does not damage the trail, and in fact helps pack the snow better for later users. In situations where they must break trail downhill and thus cannot glissade, snowshoers sometimes run downhill in exaggerated steps, sliding slightly on the snow as they do, an option sometimes called "step sliding." Also effective, are poles placed in front as you descend in a regular stride. If carrying poles and properly experienced, they can also employ skiing techniques such as telemarking. On newly fallen snow it is necessary for a snowshoer to "break" a trail. This is tiring (it may require up to 50% more energy than simply following behind) even on level terrain, and frequently in groups this work is shared among all participants. A trail breaker can improve the quality of the ensuing route by using a technique, similar to the hiking rest step, called "stamping": pausing momentarily after each step before putting full weight on the foot. This helps smooth the snow underneath and compacts it even better for the next user. A well-broken trail is usually a rut in the snow about 6–8 inches (15–20 cm) deep and 2 feet (61 cm) wide. While it may appear after heavy use as if it is possible to "bareboot" or walk it without benefit of snowshoes, this practice is frowned upon by serious snowshoers as it leads to "postholing," or roughening of the trail from places where boots have fallen through (initial appearances to the contrary, the snow in a broken trail is not sufficiently packed to support the more concentrated weight of a foot). In soft conditions, following trails broken by backcountry skiers can be difficult on snowshoes. In addition, since snowshoes destroy ski tracks, many areas ask that snowshoers observe traditional backcountry courtesy and stay out of ski tracks. Ski trails are normally much narrower than a typical snowshoe trail, and less well packed because skis offer more flotation than snowshoes. If the snow is deep and soft, snowshoers may find themselves postholing right through the ski track. In most cases the ski track offers little advantage and putting in a separate snowshoe track allows both snowshoers and skiers to have a positive experience and avoids friction with skiers who often resent having their tracks obliterated and their skiing enjoyment greatly reduced. Snowshoeing expands the potential for exercise available in the wintertime. As of 2006[update], at least 500 American schools, mostly but not exclusively in the Northeast have started offering snowshoe programs in their physical education classes to help combat obesity. It had the added benefit of being gentler on the feet than walking or running the equivalent routes, since snow cushions the foot's impact. For the same reason, it is less detrimental to the environment, since the snow likewise buffers the earth against the impact of so many hikers and campers, cutting back on trail erosion and other effects of heavy use. Snowshoeing makes even familiar hikes different and new. If the snow is deep enough, obstacles such as large boulders and fallen logs can be more easily bypassed. Immoderate snowshoeing leads to serious lameness of the feet and ankles which Canadian voyageurs called mal de raquette. Modern snowshoes are much lighter and more comfortable so that lameness caused by snowshoeing is now very rare. Nonetheless, many snowshoers find that their legs, particularly their calf muscles, take some time to get used to snowshoeing again at the start of each winter. Frequently the first serious trip leaves them sore for several days afterwards. The resurgence of interest in snowshoeing in the late 20th century was in some part due to snowboarders, who took to them as a way to reach backcountry powder bowls and other areas while they were still banned from most ski areas. Their similarities to snowboards, in shape and binding, led many of them to continue use even after snowboarders were allowed to use most ski slopes. Despite most ski areas now allowing snowboarders, there is a growing interest in backcountry and sidecountry snowboarding in the search for fresh powder. The recent development of splitboards has enabled snowboarders to access backcountry without the need for snowshoes. Downhill skiers, too, found snowshoes useful in reaching the same areas. Another popular expedition, particularly among hikers, is the "ski-shoe" trip combining a cross-country ski portion on a level, wide trail with a snowshoe up a less skiable section, usually to a mountain summit. Runners have found that using light snowshoes allows them to continue exercising and racing during winter. Like their warm-weather counterparts, events cover all distances, from sprints of 100 m to the 100 km "Iditashoe." There are even hurdle events. Snowshoe segments have become common in many multi-sport events and adventure races, including a required snowshoe segment in the winter quadrathlon. Some competitors in those events like Sally Edwards and Tom Sobal have emerged as stars. While snowshoe racing has probably been around as long as there have been snowshoes, as an organized sport it is relatively new. The United States Snowshoe Association was founded in 1977 to serve as a governing body for competitive snowshoeing. It is headquartered in Corinth, New York, which considers itself the "Snowshoe Capital of the World" as a result. Similar organizations, such as the European Snowshoe Committee and Japan's Chikyu Network, exist in other countries and there is an international competitive level as well. Snowshoe races are part of the Arctic Winter Games and the winter Special Olympics. However, they are not yet an Olympic event. The rawhide webbing of traditional snowshoes, as noted above, needs regular waterproofing. Spar varnish is the preferred waterproofing for traditional snowshoes. A light sanding is preferred before 3 coats of spar varnish is applied. Modern snowshoes need no regular maintenance save a sharpening of cleats if desired. Both kinds of snowshoe, however, can and do break. The most common damage suffered is to the frame, which can be splinted with a stick or piece of wood if necessary. Decking rarely gets broken, but if it is punctured and the hole looks as if it might continue to grow, the best solution is the patching kits made for tents. Cable ties can serve many purposes in repairing snowshoes. They can splint frames in a pinch, replace a broken rivet, secure a tie or lace, and repair winter clothing as well. ^ "Raquettes GV - Fabricant de raquettes à neige". Raquettes GV. ^ "The Times - UK News, World News and Opinion". ^ "Snowshoes and the Canadian First Nations". Snowshoe Magazine. ^ Squires, Nick (2016-09-12). "World's oldest snowshoe found on a glacier in Italy's Dolomites". The Telegraph. Retrieved 2016-09-13. This article incorporates text from a publication now in the public domain: Chisholm, Hugh, ed. (1911). "Snow-shoes" . Encyclopædia Britannica. 25 (11th ed.). Cambridge University Press. p. 296. Associated Press, February 13, 2006; Snowshoes are alternatives in winter gym class. Davidson, Daniel Sutherland (1937). Snowshoes. Vol. 6 in Memoirs of the American Philosophical Society. Philadelphia. OCLC 3394641. Drummond, Thomas (December 1916). "The Canadian snowshoe". Transactions of the Royal Society of Canada, section 2. 3. 10: 305–20 + pl. 1–6. Heilman, Carl; If You Can Walk... You Can Snowshoe at carlheilman.com date unknown, retrieved January 10, 2006. Mason, Otis Tufton (1896). "Primitive travel and transportation". Report of the U.S. National Museum for 1894. Washington: Government Printing Office. pp. 237–593 + pl. 1–25. Olmsted, Larry; Snowshoeing: A Trailside Guide, W.W. Norton, New York, N.Y. 1997. ISBN 0-393-31720-X. Prater, Gene (2002). Dave Felkley (ed.). Snowshoeing: from novice to master. Mountaineers Outdoor Expert Series (5th ed.). Seattle: Mountaineers Books. ISBN 978-0-89886-891-3. Prosek, James; February 6, 2004; JOURNEYS: Making Tracks in a World Gone Silent, The New York Times. Tucker, Jim; History of Snowshoeing, at snowshoeracing.com, retrieved January 18, 2006. Woodward, Angela; Snowshoe, at madehow.com, retrieved January 22, 2006. Wikimedia Commons has media related to Snowshoes. How traditional snowshoes are made (video).